Becoming attuned to Reiki brings about many positive changes in our lives. It begins a cleansing process that releases stuck energy and emotional baggage and allows pure natural universal energy to flow through our energy centers, our chakras. This process is similar to having a bucket of dirty water and turning on the tap to stream in fresh pure water. The more clear water flows into the bucket, the cleaner the standing water becomes. The more Reiki self healing, the stronger the flow of cleansing energy. That being said, we still have to monitor our feelings and emotions: our vibrations, to be sure we stay on track. Take a minute to check in with yourself. How is your mood today? Are you calm and serene? Confident and open to Spirit? It’s relatively easy to stay in emotional balance when things are going well, but not so much when life becomes challenging. Even the down to earth, heart centered healers can stumble on the path of serenity, forgiveness and peace when life throws us a curve. Have you ever been derailed by any of the situations below? You run into unexpected repair or medical bills. It is said that serenity is not the absence of calmness, but the ability to deal with it. We all have times when our patience is tested. We are human after all, imperfect and flawed. Sometimes our imperfections are the very best part of us. It is our flaws that teach us how to rise above them, and this is what we have to share to help others. If we were flawless, what experience would we have to pass on? Our interactions with others depends on our ability to be human. 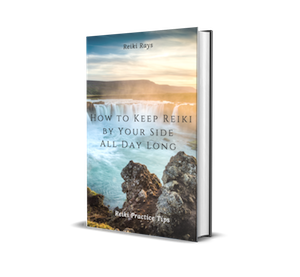 How does your serenity level affect your Reiki practice? When you are irritated, do you move closer to Reiki or push it away? A few minutes of calm healing energy can only help you feel better. Here are some suggestions to get you unstuck. Grab a crystal- Lepidolite can help elevate your mood. Smoky quartz will ground and center you. Amethyst will draw you closer to spirit. Black tourmaline is a great protector against negative energy. Choose your own favorite. Take a Reiki shower- begin with several deep calming breaths, use Cho Ku Rei to call in the energy and Sei He Ki for calm. Once the energy is flowing, brush off negativity with your hands in long downward strokes. I have actually done this in the ladies room stall. It works! Call in your angels, they are just waiting to assist you. Also remember, just because your day may be off to a rough start, this does not mean you have to suffer all the way through until your head hits the pillow at night. You can start your day over at any time. Treat yourself to some warm healing Reiki energy and a cup of chamomile tea. Be your own best friend. You need to take care of yourself first in order to heal others. Patti Deschaine is a traditionally trained Usui Reiki Master, Lightarian Reiki Master, and owner of Maja Energy Works and Reiki Healing. She resides and practices in Wilmington, NC. She enjoys all types of Reiki and particularly loves using Reiki on animals. Patti can be found at http://majaenergyworksandreikihealing.com and https://www.facebook.com/MajaEnergyWorks.